Wireless sensor networks are particularly relevant to preventative care offering patients the potential to enjoy their home environment, minimise their time in hospital, improve their quality of life and hopefully prolong their life expectancy. The recent rapid advances in wireless communications, global digital systems, microelectronics, nano and micro-systems offer an ideal opportunity for major changes in medical care. Organisations worldwide are now looking to capitalise on these technology advancements and move away from the conventional medical approach where people visit doctors and attend hospitals for treatment, focusing mainly on treatment rather than preventative care. New opportunities now exist where medical systems can be developed which offer preventative care and focus on delivering this directly to the person at home. An ultimate goal would be for people to live their life with non invasive sensor system monitoring critical parameters relevant to their genetic make-up, lifestyle and any medical condition they may have. Information will be transmitted directly to the health service provider for analysis and if a change has occurred which requires an alteration to any drugs or possible treatment, then the person is advised of this and the necessary appointment made. To complement this preventative care monitoring will be advanced treatment. This may, be in the way of intelligent implants, minimally invasive surgery or drugs designed specifically for individual’s own genetic make-up. Wireless sensor networks are particularly relevant to preventative care, offering the potential for people to enjoy their home environment rather than having to live in care or nursing homes, minimise their time in hospital, improve their quality of life and hopefully prolong their life expectancy. Whilst we are still many years away from the time when systems will be made generally available, there are already some pilot programmes developing. Once the clinical efficacy of new medical systems are demonstrated, these systems can be developed for general use. Whilst this is likely to take up to 10 years to reach maturity and pass all the necessary clinical trials, it is encouraging that R&D programmes are pushing the technology barriers and preparing the way for many more medical systems in the future. Glaucoma is where the pressure in the eye is so high that it damages the retina and can ultimately cause blindness. This new system monitors the change in curvature of the eyeball which results from a build-up of pressure and this data can be transmitted directly to the health advisor (Image-1). An alarm will be triggered when the pressure reaches an unacceptably high level and the person would be called in for treatment. Currently, the only means of monitoring pressure is at the ophthalmologist where a spot pressure reading can be taken. This proposed new system will enable measurements to be taken over a 24 hour period and on a regular basis. It is hoped that those people suffering with glaucoma would all be provided with their own wireless system and be regularly monitored, ideally, preventing blindness. This pressure sensor system would be permanently implanted and pressure readings taken remotely on a regular basis (Image-2). The data would be transmitted to the health provider and if the pressure exceeds the alarm threshold, then the person would be called in for immediate treatment. The pressure sensor needs to be stable for a lifetime as once implanted it should never be disturbed. Example applications include hydrocephalus patients fitted with a shunt to drain excess fluid from the brain cavity. If the shunt blocks then the pressure can reach dangerously high levels that can result in death. 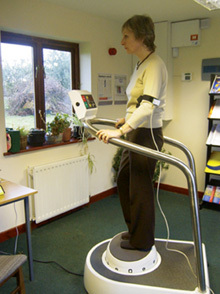 This example shows a person being monitored whilst on the ‘BalanceMaster’2. This machine has been designed specifically to help people improve their balance. 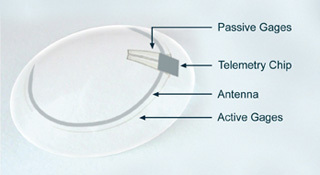 The sensor system is used to ascertain how they respond to treatment. On-the-body sensor systems can be used to monitor a range of conditions. For the elderly, this could include monitoring their balance and ultimately determining if they have fallen. They can also be used to trigger intelligent implants, (for example, the upper limb FES under development in the Healthy Aims project). The human body has a number of sphincters which, if they fail, can cause embarrassment, discomfort or in extreme cases death. For example the oesophagea sphincter is at the top of the stomach. If this partially fails, then conditions like heartburn can occur and if not treated this can ultimately result in cancer of the oesophagus. Using the sphincter sensor to monitor if the sphincter has fully closed would enable to correct treatment to be given to those that require minimally invasive surgery. This is just a selection of sensor systems that can be used to monitor different aspects of a person’s health. There are many more products under development by clinical groups and medical device companies both in the EU and worldwide. (For example, a large niche market includes people suffering with urinary incontinence who are fitted with catheters). The Biomed HTC3 in Bristol, UK, is guiding the development of new diagnostic equipment and medical devices to help improve the quality of life and reduce hospital costs of patients. Functional stimulation to enable muscles to be activated when the nervous system has failed. Examples include upper limb motion, bladder and bowel control. 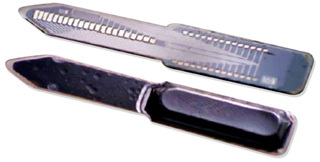 The 2 electrode designs shown in images 4 and 5 utilise micro and nanotechnology, with both having features in the order of microns, substrates down to 10 microns and electrode density constantly being driven down in order to improve the performance of the implant. For example the modulus electrode shown in figure 4 is used to trigger the nerves in the inner cochlear stem to improve hearing whereas the electrodes in image 5 are used to trigger the ganglion cells at the back of the retina. It needs to be recognised and understood that whilst generic technology development is an essential part of any early stage R&D project, once the work progresses to the detailed design and fabrication level the work becomes product-specific. 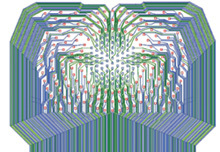 For example, the electrodes in images 4 and 5 use different substrate materials, the electrode structure and topology is different as are the interconnects to the electronics. Thus generic technology development can only be taken so far before specific design and fabrication work is required. The Healthy Aims project is an excellent example of how a selection of key people across Europe can form together to turn an academic road map for implants and diagnostic equipment into reality. A limited amount of core technology development is included. However, the majority of the work is focused on the integration of technologies to produce new medical products that are suitable for pilot clinical trials. In the future, in order to be able to build upon the work already under way in the medical sector and generate critical mass in the area of medical care strong leadership from major medical organisations and national governments across the EU and worldwide is required. Infrastructures need to be put in place that can handle data from a range of sensor systems, medical implants and in the future drug delivery systems. Formulating strategies at the international level will stimulate demand for new systems and encourage innovations across the medical sector. For this to be done effectively and efficiently, road maps should be developed for both the ‘Business systems’ and the ‘Products’. This approach is now being recognised within the EU as necessary when addressing major challenges such as the ‘Future healthcare in Europe’ and leading technologists and business groups are formulating their own future strategies around such models. The questions yet to be answered are based around how well the technologists, clinical experts, purchasing groups and national bodies can work together to enable medical systems that are technically feasible to be commercially available within the next twenty years.